Welcome to Patriot Manufacturing, LLC. 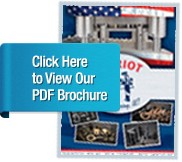 Our team at Patriot believes that quality manufacturing is fundamental to America's future. Today's businesses demand R&D and design assistance, rapid turn around on quotations, tooling, and parts as well as uncompromising quality, all using cost effective approach. © 2007-2019 Patriot Manufacturing, LLC. All rights reserved.